On my I8 I get a only 16 miles showing on a full 110 volt charge Pull out and drive like an old lady and I'm lucky to get 10 miles or so on E mode. Drive around in Comfort mode and it quickly deteriorates unless you select "Hold State Of Charge" on the menu. Sport Mode quickly re-charges the battery but only to 12-13 miles – My car re-charges the battery 1 mile for each 2-3 miles I travel at 60 mph. For me "Since I don't race my car" the advantage of the battery is just a safety margin thing in the un-likely event of an engine failure I can get off the road and hopefully somewhere safe. The second advantage for me is I can back into my garage exhaust fume free – this I like! Looks like BMW added a little "Hollywood" in their release of this mileage thing, I called into BMW tech service complaining about the mileage and I'm yet to get a call back after 4 days. 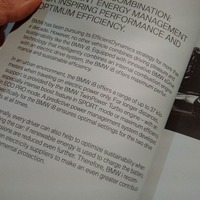 I was going to reference a recent InsideEVs article in response to the previous comment about the EV range of the i8. The consensus among the commenters there seems to be that the EPA test procedure for evaluating the EV range in blended hybrids is not fully baked yet. This is exemplified by the comment I copied below. Its a blended phev, and the epa hasn’t quite wrapped its arms around the label versus an erev phev. The harder you accelerate the more gas you will use. Charge depletion range is probably better than electric range, but it will be AER if you press a button, but button pressed, you will not be able to tap into the full acceleration. What really hurts is the fact even the owners manual shows an image of the dash with 25 mile electric range - this is not possible with the car they have released - I bought the car in good faith that it could be used for short trips in electric mode and in fact this is not possible - even charging it on the 110 volt circuit only brings the battery to 15-16 miles yet it shows full charged. BMW needs to address this problem. I have an appointment on Tuesday for my vehicle to be looked at. I'm told the BMWNA techs will be coming. I don't know what they will find, but I hope it's to enable more miles on the battery (somehow). I'll keep you all posted. I do feel ripped off. Dave please keep us informed - most all I8 owners are complaining of the same low milage readings - if a full charge only shows 16 miles, there is no way in the world you will get any where near 20 miles. 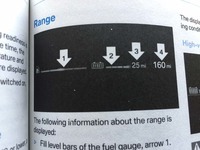 Even my I8 manual shows 25 miles on a battery illustration. Not minimizing the conversation above specific to the i8, as I am interested to know the methodology behind the ratings too. I can make the GOM on a Volt, i3, Leaf or HondaFit say a ridiculously high estimate by driving 18 miles at 20mph with no heating or AC turned on then do a full recharge. You can do a similar range test if so desired. Come Spring/Early summer your GOM will probably always say 25 right up until heavy cooling season starts in June/July. It's unfortunate that EV drivers take delivery during cold weather so they never see the full battery potential reflected in the GOM number. We see this type of story every year, across every make/model of EV. Most important the I8 fully charged only shows 16 miles range - of course this is ideal conditions - it the battery only charges to 16 miles there is no way possible to get 25 miles from it period. On the I8's defense - it does go to 0 miles at 12% SOC and you can drive an extra mile or two after the gauge goes to - - - - and the engine self-starts. I can easily drive your car further than 16 miles all electric by doing the range test I described above (driving slow with no HVAC) I know who wants to drive slow in an i8?? The car is charging fully to 100% but estimating by your past driving style that you will go 16 miles. The volt does the same thing. The GOM says 40 miles of range but I can easily get 48 or 50 before the gas engine comes on just by avoiding highways and taking slower secondary roads. You should perform this test if you are able to. Believe me there is nothing you can do to an I8 to get even 14 real miles much less 20-25 miles they publish - its just not going to happen! I talk to maybe 30 owners and everyone is in the same boat - top mileage even with a "Full Charge" of 16 miles showing you are lucky to get 10-12 miles. From my home to town is 12 miles - it is totally flat and the speed limit is 45 mph - temperature 60 degrees - no AC - no heat - no seats - no radio - no lights - I cannot get to town -I've tried it numerous times. BMW has to admit the mileage estimates are wrong. Think about it - if the dash on the I8 shows full charge of 16 miles - what in the world would make you think it will go 25 miles . On my I3 when it shows 75 miles on the read out I can get 75 but I can't get 90 or 100 miles. I found the i8 brochure online. This is the text from page 12. Putting impressive power and control in the driver’s hands has been a signature of BMW from the start – and with the BMW i8, the tradition continues. The electric motor gets its energy from the high-powered 7.1 kW lithium-ion battery contained in the Drive Module. Working together with the TwinPower Turbo 3-cylinder combustion engine in the rear, for a combined total system output of 357 hp and 420 lb-ft of torque, the BMW i8 is launched from full stop to 60 mph in a breathtaking 4.2 seconds.1 The BMW i8 can also be silently, electrically propelled by just a push of the eDrive button and a slight tap on the accelerator. Calling on 129 horses with 184 lb-ft of torque, its top speed of 75 mph and maximum electric-drive distance of up to 15 miles is ideal for many daily commutes. Plug-in hybrid power: now delivering a whole new level of gratification, power and efficiency. Thanks for the reply - Isn't this what I have been saying from the beginning - the problem is; this 20 -25 miles is even shown in the owners manuals and in the minds of every company and person that does a review leaving a false impression of mileage. This is a NEW brochure you have a link to. They updated it recently I see.... I have copies of the old brochure and as you said, our owners manual shows 37KM! 37KM = 22.9907 Miles. Not 15! Of course when you read the mileage in you own owners manual you are also led to believe you would obtain that mileage as well. As I mentioned, we live around 10 miles from town and when we purchased the car we had plans of driving in electric mode to town each morning which is now impossible.